There’s a lot going on! Here’s a roundup of what’s happening in the US on various fronts …. Restore the Fourth has a congressional call-in day on Friday, leveraging StopWatching.us’s 1-323-STOP-NSA number. Restore the Phones: Tell Congress this Isn’t Over has the details, including a link to a basic script. Restore the Fourth is also planning another round of protests on August 4, and a campaign focused on town hall meetings during Congress’ summer recess. There are lots of other exciting ideas bubbling up in the discussions and in local organizing meetings. Get involved! The EFF got a big win when federal judge today rejected the U.S. government’s latest attempt to dismiss Jewel vs. NSA, rejecting the government’s claim that the the state secrets privilege means the case can’t even be heard. Of course, this is just one small step in a very long road (the EFF filed Jewel five years ago, and this victory builds on the earlier Hepting case which was dismissed after Congress gave the telco’s retroactive immunity in 2008), but it’s a great ruling. Philip Bump in Atlantic Wire has more. EPIC filed a writ of mandamus directly with the Supreme Court. Lyle Dennison on SCOTUSblog has a good discussion of how unusual this is and disection of EPIC’s brief. James Risen in the New York Times and David Kravetz in Wired have more, including the context of other lawsuits by ACLU and Judicial Watch. A coalition of privacy organizations filed an amicus brief backing Google and Microsoft’s requests to reveal aggregate data about the federal government’s access to user information. Yahoo is also fighting for transparency, petitioning the FISA Court to declassify documents from the 2008 decision which show that Yahoo “objected strenuously” to providing the government with customer data. A writeup of the DC rally, with a YouTube playlist of the speakers, some rallygoer reactions, photos, and more. RestoreTheFourth/DC’s rally organizer Andrea O’Neill led off, followed by assisting coordinator Louise Brooks, who introduced the remaining speakers. It’s the Fourth of July, and we’re fighting for our civil liberties. In New York, 500+ people filled four blocks. DC featured an all-star cast of speakers, 400+ people, and 20 news organizations. In SF, the 300+ people wound up the rally at 611 Folsom, the home of the famed room 641A. 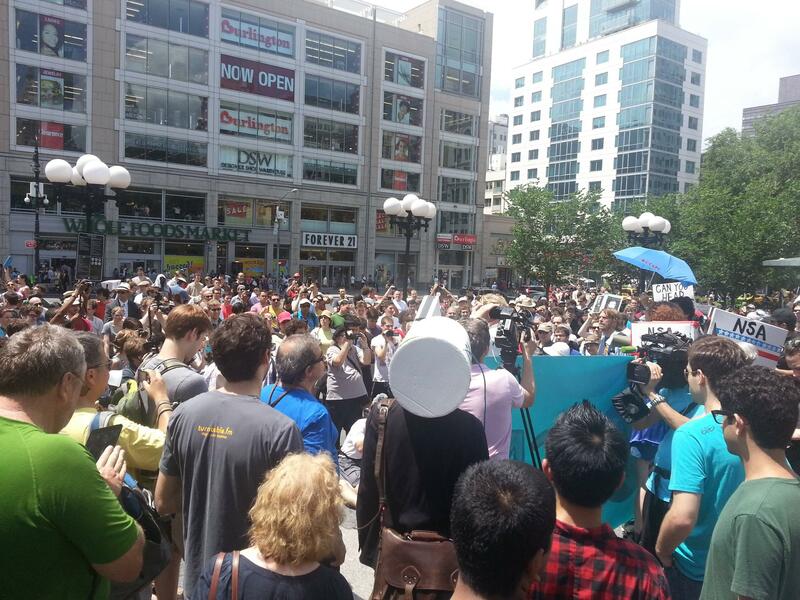 The Salt Lake City rally ended with a march on the NSA’s Utah data center. Coverage on NBC, Fox News, The Atlantic, Reuters, CNN, CNET, Mashable, CBC, the Christian Science Monitor, the Times of India, Buzzfeed (with the “40 best signs“) and dozens of local TV stations and papers. Update, July 5: more from the Washington Post, the Guardian, ThinkProgress, VentureBeat, Firedoglake, Newsmax, Hullabaloo, All Things D, Nextgov, an AP video, RT, the Daily Caller, the Sydney Morning Herald, US News and World Report, and Vice. 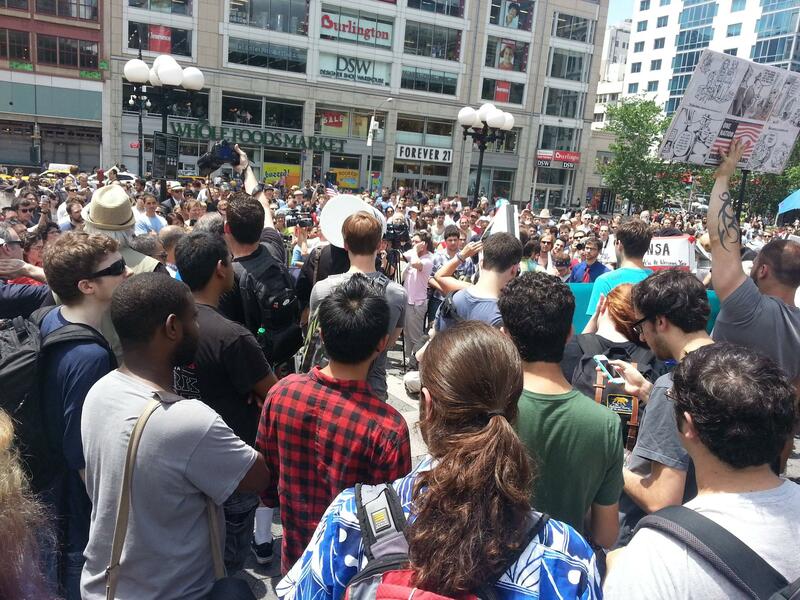 NMA Weighs in on #restorethe4th from Taiwan! Next Media Animation weighs in from Taiwan. Y’think this could go viral? A great addition to today’s coverage. PS: for background on Next Media Animation, see Taiwan Tabloid Sensation Next Media Re-Creates the News in Wired. Thousands of Americans will fogo the traditional Fourth of July backyard barbecue or beach trip this week, instead choosing to join nationwide rallies against recently revealed National Security Agency surveillance programs. The protests are being organized by Restore the Fourth, a 23-day-old organization that spawned on Reddit in reaction to the NSA revelations. 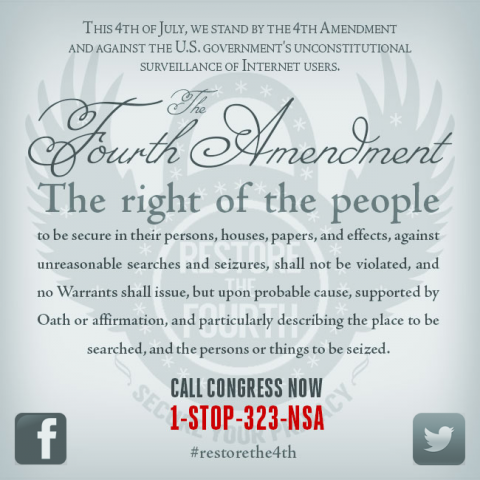 Restore the Fourth’s long-term goal is ending what its members consider the NSA’s unconstitutional surveillance regime and reinstating the Fourth Amendment’s protections against unreasonable searches and seizures. The July 4 rallies and Internet Defense League’s “Cat Signal” are getting some high-profile hits, with articles in Time, The Hill, techPresident (by Sarah Lai Stirland, who covered Get FISA Right five years ago! ), the Washington Post, the BBC, Boston Globe, techDirt, Ars Technica, gigaOm , CSO magazine, and more. We’ve collected some of the recent coverage using Storify. The surveillance opposition efforts have so far brought together an eclectic group of supporters, including two unlikely partners — an Ohio Tea Party association and Occupy Wall Street NYC. This bipartisanship is an advantage Reed thinks will make Capitol Hill lawmakers stop and listen. As we head into the July 4 rallies, I thought it would be useful to collect some useful links. For organizers — or people wanting to get the word out — the best place to start is Restore the Fourth’s website at restorethefourth.net, where there’s a a FAQ, list of protests, , the June 18 press release, and a resources page (including logos, flyers, and guides for organizers on media and outreach). There’s also a wiki page with more resources on Reddit; and of course r/RestoreTheFourth subreddit which is the best place to go for links, questions, and discussions. Bill of Rights Defense Committee’s How to protest against NSA surveillance on Fourth of July and the reddit threads on first-time protestors and talking points all have great tips, tricks, and general advice. Rand Paul and Alan Grayson both have released supportive videos. 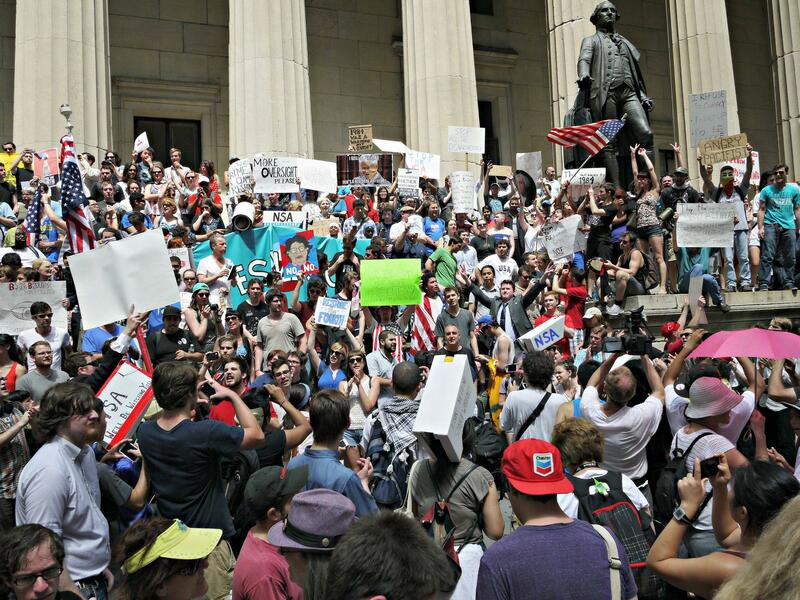 For the Fourth of July actions, Fight for the Future has a great summary of how you can get involved online as well as in-person in response to the Internet Defense League’s Cat-signal. You are currently browsing the Get FISA Right blog archives for July, 2013.